SubC 2tone, black dial or blue sunburst? Stunning watch, what reference is that with the diamond dots ? 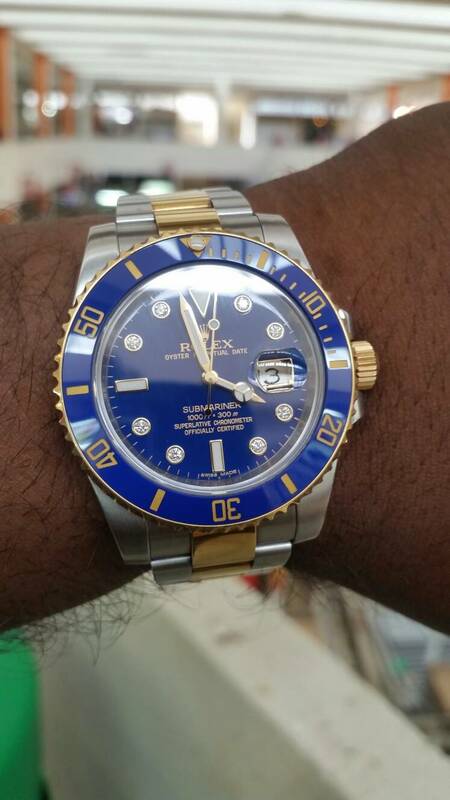 same reference 116613LB.. but this diamond dial version is discontinued.. I'm leaning towards this as my next purchase as can't get anywhere close to a Daytona. I just ordered a new 116613LN (black/gold) from DavidSW. It's my third rolex having come from the GMT2 stainless and GMT2 TT back when they were first released. I definitely missed the latter. My next step is the all yellow gold stick dial Basel 2015 Day-Date. The blue sub was never a consideration as I find it a bit Corvette/oldguy/goldchain *for me* as a younger guy who likes his skinny jeans and HRE wheels. For me it depends on what colors you wear the most. If I look at the YG Sub black dial next to a blue dial, I think the blue looks better. However, I wear a ton of blue shirts. Probably 4 days out the week I am in some shade of a blue shirt. And I feel strongly the blue dial is way too matchy-matchy if you wear a lot of blue shirts. If you wear a lot of blue, go with the black dial. And the above doesn't apply to black shirts and black dial, that looks fine. I,own a blue and never wear it. It's too,loud. For me. I wear a deep blue a lot and find it far easier to read because it's bigger, oddly no one, not kidding, has ever commented or looked twice at the blue sub. Frankly, what turns me off much about the blue is the bracelet. 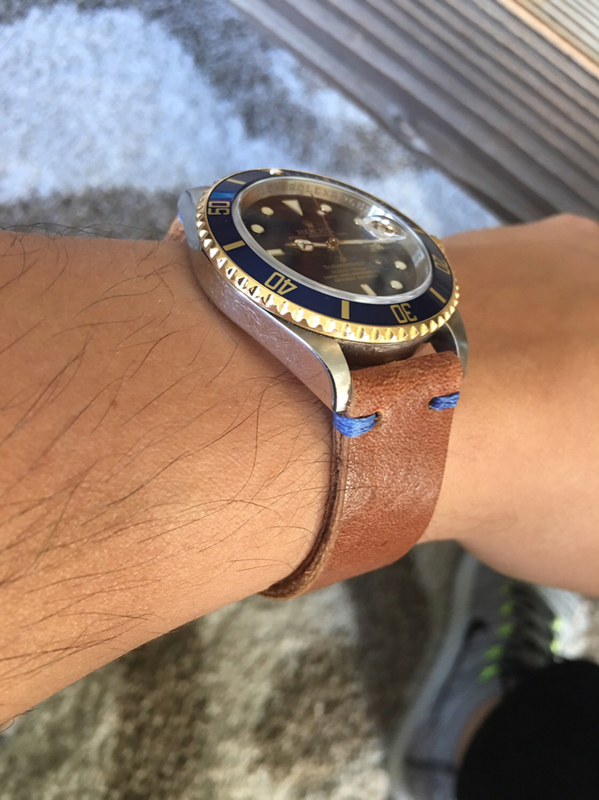 I've often though about buying a sub bracelet and pairing the blue dial with the stainless bracelet. I personally think that would be beautiful,. The bracelet is gawdy to,me. I know it has good and is well made. But I think it's too,loud. Just got it and thought I'd add to the pile - thanks! Originally really wanted the Bluesy, but wasn't sure if I'd get bored of the colour one day. I got the other colour instead, i.e. Black. Both is great and very hard to choose between the two I agree. If you get black then you will want blue. If you get blue then there for you can move on. What color is the water when you dive into the water? Black is much more like a Dead Sea, would you dive into Dead Sea? 16803, tritium dial. Pardon the fingerprints, can't keep my hands off of it. I have a blue one and it is a beauty. It makes me happy just looking at it. However, it is a bit too flashy for my personality. I am getting a sub no date today for daily wear and keep the blue for special occasion, or when my mood hits. Blue is my favourite colour so its no contest. I like the green but that's a bit off topic. Any dial colour is good. 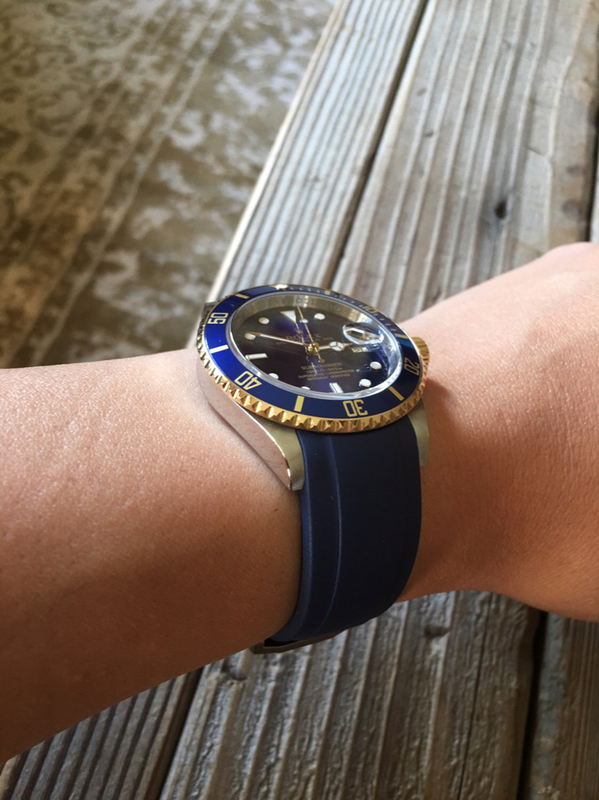 You have to go with the blue when it comes to the two tone sub. IMO the 2 tone black looks better on the GMT. Blue is a flavor of choice. GMT IIc 116710, Yacht-Master 116622. Datejust 41mm 126334. Sub 116613LB. I have never complained about how heavy the load is,I always work on having a stronger back. Four years later, and people are still replying to this OP. I Love It!